LATV Live: Music Sessions Is Back! LATV Networks, the original national, multi-cultural, bi-lingual entertainment network is proud to announce the return of LATV Live: Music Sessions, a special edition concert series featuring rising rock bands and one all day, non-stop live stream of musical performances and in-studio artists interviews. 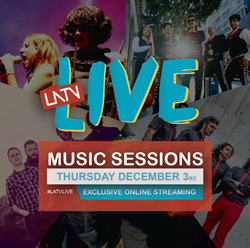 LATV Live: Music Sessions airs Thursday, December 3rd, starting at 10AM PST / 1pm EST. Viewers can watch by logging onto LATV.com. The live stream of in-studio performances will also feature previews of LATV’s new digital and broadcast content. LATV is the original, alternative, and only remaining Latino-owned TV network in the Hispanic television space. As a pioneer network, a trend-setting brand, an innovative content hub.